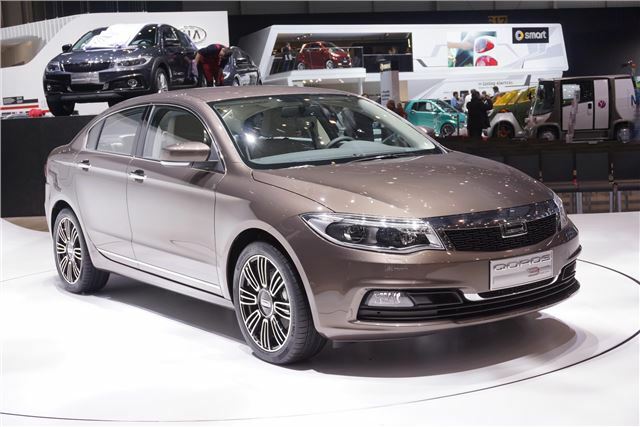 New Chinese car maker Qoros has debuted its 3 Sedan at Geneva. The saloon is similar in size to a Skoda Octavia and will go on sale in Europe towards the end of 2013. The styling, overseen by ex-MINI chief designer Gert Hildebrand, has been kept deliberately low-key. It's also well-equipped, boasting the latest in internet-enabled online functionality thanks to 3G connectivity. Key features of the new car are grouped around its eight-inch touchscreen, which has been designed to control all the major functions, meaning fewer switches, dials and buttons in the cabin. It features sat nav, a car health monitor and web connectivity. Power comes from 1.6-litre petrol engines, with or without turbocharging. Qoros has big plans for its launch into the European market. It was certainly serious at Geneva with its Qoros 3 on the front cover of the official motor show catalogue. The 3 Sedan is now entering a pre-production development phase and is due to be launched in China in the second half of 2013, with first European sales following later in the year. The launch of further Qoros models is then planned at intervals of approximately six months. The Qoros range will be built in Changshu, China, but is being designed and engineered by an international team - and is working in partnership with Magna Steyr, TRW, Continental, Bosch, Getrag, Benteler, Lear, Microsoft, Harman, Neusoft-Alpine and Iconmobile. There are also two Qoros concepts on show, the 3 Cross Hybrid and 3 Estate, which are exactly as they sound – a hybrid crossover model and an estate variant of the 3, giving a clear indication as to what will make up the second tier of introductions.